Within moments I had slipped into my swim suit and despite the cool-ish temps, zipped up to the pools, one regular heated pool, another hot pool, both blasted from the hillside rock. The sky was blue, trees towers around the periphery, shimmering fall colors speckled among the evergreens. Absolutely dreamy, a few laps, some long stretches just floating around and taking in the peace and quiet of the moment. 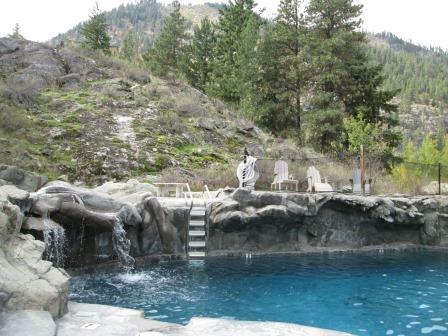 The main pool, with the hot pool hidden just to the left above the waterfall. Twenty years ago I might have wanted to spend the whole day in one of those beer halls. Now? This is my kind of bliss. 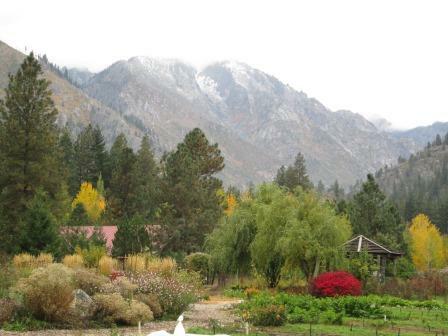 One friend remembers this property–67 acres a few miles south of downtown Leavenworth–as a Catholic youth camp she attended as a kid. While in camp mode, the property was upgraded a bit to serve double-duty as a retreat for adults off-season. But in the early 1990s the property went up for sale. Harriet Bullitt owned property adjoining that lot and purchased the camp property to ensure the land’s preservation. 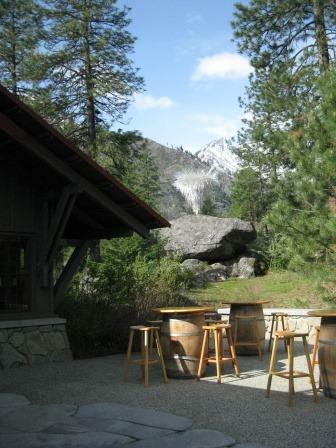 After some upgrades/amendments to the buildings on property, she launched Sleeping Lady in August 1995, originally with an eye toward small conferences and group events, including the first annual Icicle Creek Chamber Music Festival hosted the year the property opened. While there still are group activities that take place on property now and then, Sleeping Lady has become in recent years more geared toward leisure travelers, families, seasonal weekend packages (skiing, horseback riding, even cheese-making!) and such to attract individual guests. The place manages to still echo its camp roots, guests rooms are clustered in groupings like summer camp cabins of our youth. And the Kingfisher Restaurant is reminiscent of a dining hall, a large open space with tables crammed together and buffet service of breakfast and dinner. But there are loads of stylish upgrades, it’s not exactly a bargain get-away. Those pools? Love them. Had one of the best massages of my life on our first trip, the beds are dreamy-comfy, it’s a peaceful gorgeous setting, spacious rooms, the small but cozy Grotto Bar with selections that include a number of local spirits. This piece is called Shaman Salmon, which we happened upon in the meadow. We dined the first night on an array of antipasti, salad of wax beans with pistachios and chèvre, roast bison rib-eye, Alaska halibut with grains and grilled eggplant; next evening included local fingerling potatoes with shiitakes and fennel, wild salmon with chermoula and a particularly delicious celery root gratin. For breakfast, selections include the yogurt/fruit/cereal category, fresh pastries, scrambled eggs, bacon/sausage and the like. We lunched in town this trip, but for guests on property it’s a brief walk to their O’Grady’s Pantry for sandwiches, salads and light mid-day bites. One of the coolest things about Sleeping Lady is the art that’s scattered around the property, some of it obvious, other pieces less so. 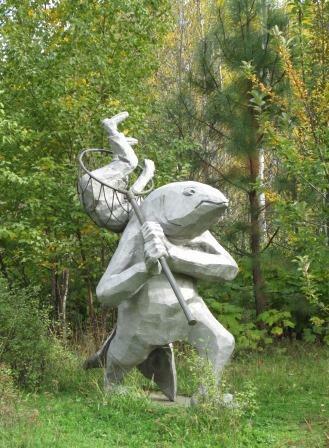 A couple dozen works are found near the sleeping quarters, in the garden, along paths, in various buildings. The Chihuly Icicles (center, on the rock) in their element. The most striking is surely the “Chihuly Icicles” mounted high on a rock just alongside Kingfisher Restaurant. And a personal favorite is the Evil Eye Tree with many striking glass evil eyes hanging from a knobby fruit tree. You can let all the art surprise you as you meander around the property, though they provide a great detailed map to help with the hunt. Ms. Bullitt is the daughter of Northwest luminary Dorothy Bullitt, founder of KING Broadcasting with a legacy of civic leadership and philanthropy. Harriet serves as a trustee on the board of the Bullitt Foundation founded by her mother, which has a mission today “to safeguard the natural environment by promoting responsible human activities and sustainable communities in the Pacific Northwest.” Preservation of the Sleeping Lady property echoes her own personal mission to safeguard the natural beauty of the place for folks like us to enjoy. She lives just across Icicle Creek from the resort, we saw her riding her custom ski-lift type conveyance across the river one day. A strong guide, she seems to be, her devotion to celebration of the arts, preservation of resources, and enjoyment of the natural beauty is infused throughout Sleeping Lady. I’m not sure why it took so long to finally get to Sleeping Lady last spring, but it was the perfect choice when I needed a peaceful refuge in the midst of a busy/stressful time. That was early March, very low season, a placid setting for some re-charge time. I was invited back this month to meet the new chef and learn more about the property; knowing how much we enjoyed it before, we opted to book an extra night to make the most of the trip. It was more lively this time of year, lovely weather, autumn colors, a wedding party, a yoga group, seasonal festivities. I’m sure it’s a fully different atmosphere with outdoor enthusiasts making the most of that lush winter snow. This is a place that clearly takes on a slightly different character as the seasons ebb and flow, and with the people that come and go. Reason enough to keep it on the list for future local get-aways.